Question: If the entire Torah (Kabbalah) talks only about love for others, then why should we correct ourselves? Isn’t it enough to simply have a good attitude toward each other? Why do we have to worry about anything else? Answer: We exist at the lowest, animate level; we simply live and die (“animal” means a “living, animate” creature). Our task, however, is to ascend to the level of man, to become “similar” to the Creator. But how do I ascend 125 spiritual degrees to reach this state? To this end, there is a special hidden force: the Torah, the Light. If it affects us, we evolve and ascend from the animate level that we currently perceive as hate for others to the human degree of love for others, which is equivalent to love for the Creator. The initial (1st) and the final (125th) spiritual states have already been established; I am clear about what I am at this moment and what I must become. Hence, there is no point in thinking about the conditions that are given to me at this moment or about my nature. Nothing is up to me, and all of it has already been recorded within the root of my soul. I must simply concentrate on how to advance and correct myself. 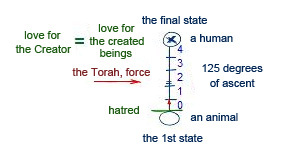 Hence, it is said that the main rule of the Torah and all its commandments is love, and each correction to any part of the will to receive is a small attainment of this love. There is nothing but love and hate: the broken desire to receive selfishly and the corrected one to bestow.